What are the chances of your dishwasher not latching or draining properly, you ask? Plenty, actually! And these are only two of the possible problems with this appliance. 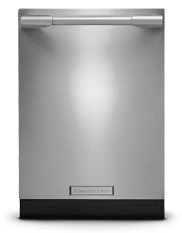 No matter what the problem with this appliance is, call us to provide dishwasher repair in Vaughan, Ontario. With our fully stocked service vehicles and the expertise of our technicians, any dishwasher problem will go away in a breeze. When it comes to dishwashers, what we also offer at Appliance Repair Vaughan is installation, parts replacement, and maintenance. In other words, our company fully covers your dishwasher needs. And the time of our response is rapid should you need our assistance in Vaughan urgently. Most problems create great inconvenience in the kitchen. And that’s one of the reasons why our company provides quick Vaughan dishwasher repair service. Another reason for us providing quick service is emergencies, like the dishwasher overflowing. When there are appliance leaks, the problem is serious and not just with the dishwasher. There is a big chance that your kitchen floor will be ruined too. So call us if there is water dripping. Get in touch with us for any other problem. There is a nasty smell inside the appliance? What’s preceded before any dishwasher repair is troubleshooting. Our pros thoroughly examine the appliance to diagnose the problem. In most cases, issues pop when parts wear. Some break too. If you fail to maintain the appliance, parts will eventually erode too. The increased humidity and daily use create problems in the long run. And that’s what we are trying to prevent with our dishwasher maintenance service. If you trust our pros to run routine checks annually, there won’t be any problems. We do any dishwasher service in a timely and professional manner with the sole intention to prevent issues. Let our pros know if you need dishwasher installation. Your appliance must be set right to operate efficiently and without leaking water. It must be leveled and properly connected to perform right. And that’s what we guarantee with our service. Your dishwasher is a valuable kitchen appliance. But it will be useful and practical as long as it operates right. When it comes to services – whether preventive or not, contact our company. As ace dishwasher repair Vaughan specialists, we can help you with just about anything with this appliance.